Well, it is definitely Spring and are your itchy, watery eyes and runny, sneezing nose telling it what season it is too? It stinks...just when you start to see the sun again and warmer weather, just when you start to think cold/flu allergy season is over and hope is coming with spring/summer...allergies hit and that last cold hits! The itchy watery eyes and the stuffy noses are the absolute worst – but the one constant by our sides this Spring: Scotties Facial Tissues! 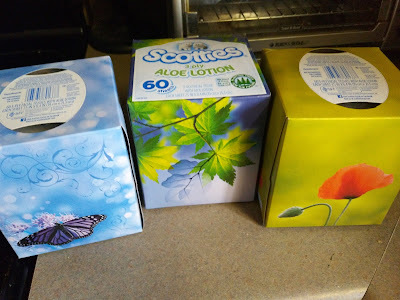 They offer the everyday comfort that my family needs for sensitive little noses, but also the strength and softness for when symptoms are at their worst, especially for Mom and Dad. Thank you Scotties for taking care of us this Spring! Scotties is generously offering (1) Care Pack of soft tissues plus a $25 Amazon gift card to a lucky winner!